I never lived in a New England state, but that’s where most of my relatives are from and I’ve spent many years visiting them throughout my life. The particular accent embodied by New Englanders is certainly intriguing to the ear and occasionally challenging to one’s comprehension. 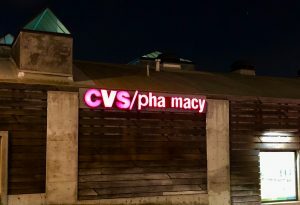 I recently encountered this piece of Silly Signage in West Hollywood, which as a result of one letter failing to properly light instantly shifts the pronunciation to New England style.